Happy National Machine Quilting Day! Prairie Lily is featured on the cover of “Little by Little, Quilts in Miniature” by Mary Hickey (That Patchwork Place 1988) and has always charmed me. I decided to make it for our local quilt guild mini quilt auction which will take place at this year’s quilt show. 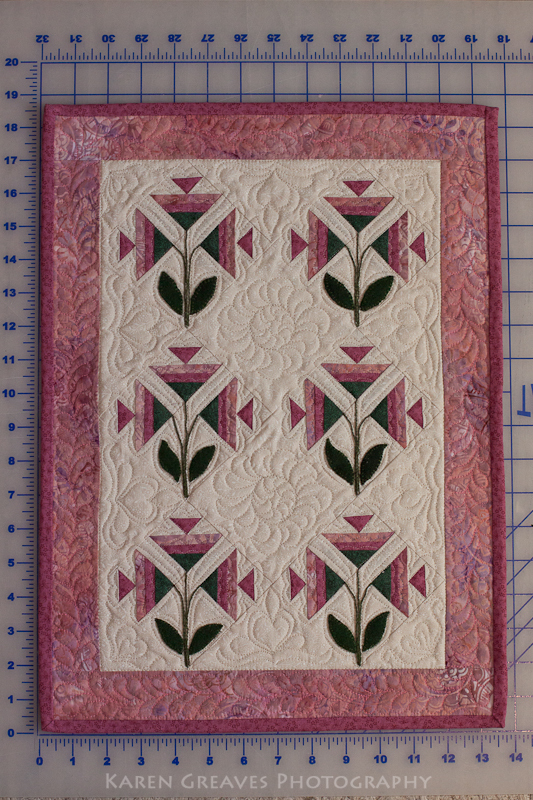 I drew the block pattern (flower part) in EQ (Electric Quilt software) so I could print out paper foundation pieces. This allows for a ‘sew by number’ type of construction. 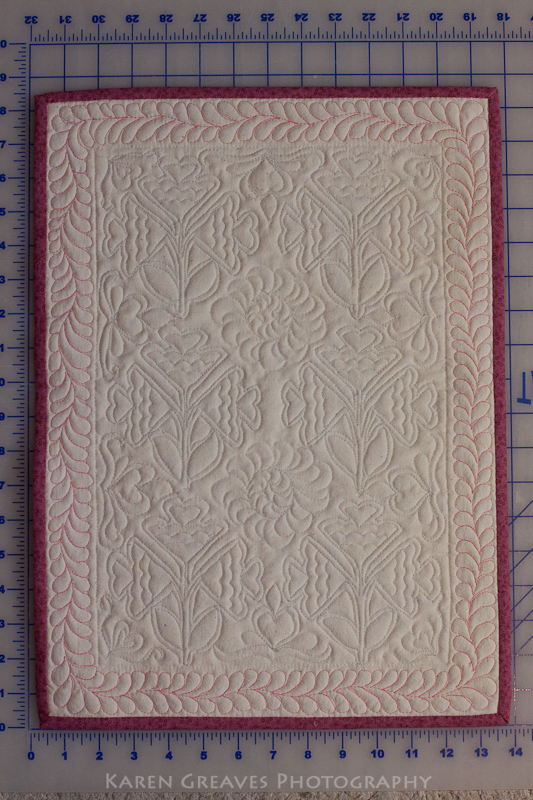 The machine quilting was all done free hand (no templates or marking). This was the first time I changed the threads on the back to match those on the front. That way I didn’t have to deal with the top or bottom thread showing up on the wrong side which was what was happening as seen below. I removed the heart border stitches, put pink thread in the bobbin and decided to do a feather border instead! Beautiful work Karen! I have a quilt I started years ago but never finished. Sounds like you’re going to have great weather there for a few days. Enjoy! Karen, this is beautiful. 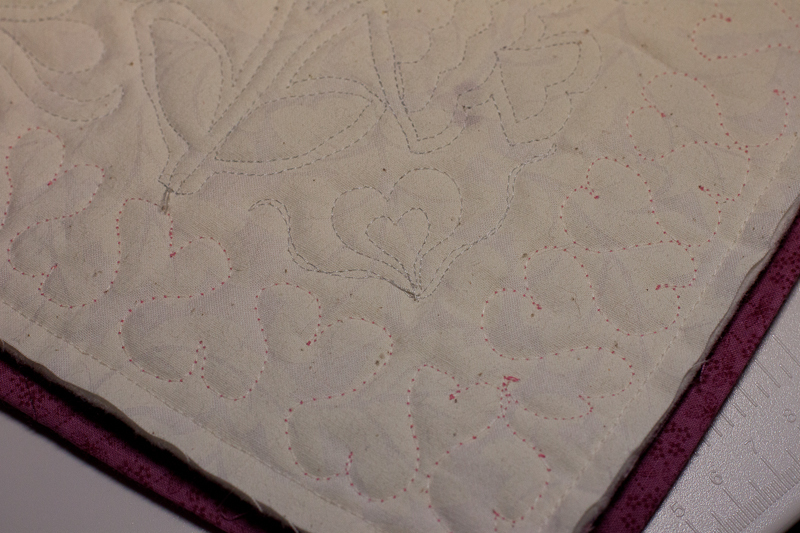 I love quilts and the skill required to do them….either by hand or machine. Always wanted to try one…..never know! Lovely! Just Lovely! A few friends and I from Thunder Bay Quilt Guild are travelling to your quilt show this weekend. We are only going to be there Saturday and I am so sad I will miss your Machine Quilting Class on Sunday – looks like I could learn tons from you! Maybe we could entice you to come to our show next year!! Thanks for your comments. 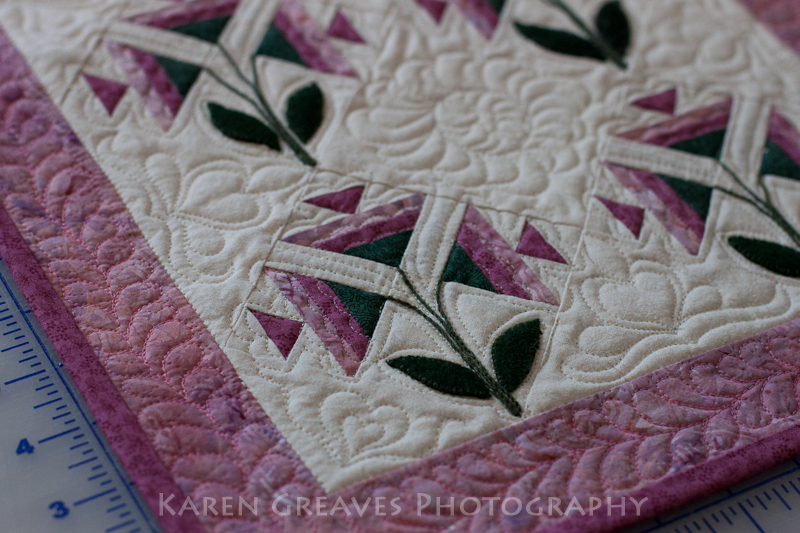 Looking forward to seeing you at the Dryden quilt show on Saturday. I’d love to participate in your quilt show next year!